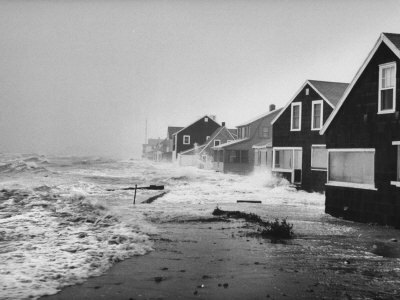 In early September of 1960 Hurricane Donna struck New England as a category 2/3 storm. The radio station WBZ announced numerous school closing led by Beaver County Day School and closely followed by my primary school on the South Shore, Our Lady of the Foothills. My older brother and I were happy to stay home. We were new kids in town. That morning a raging gale whipped through the woods of the Blue Hills. Telephone wires moaned with each gust and the windows ofour split-level ranch house windows vibrated in their sashes. The electricity died at noon and my father lit a kerosene lamp, which he placed on the kitchen table. Our family of seven huddled around the flame like Neanderthals sheltering in a cave. Several hours later the howling hurricane abated to a whisper. “Where are you going?” my mother demanded with hands on her hips, her voice ringing with the authority of a woman, who had carried five babies in her womb. “Outside to show them the eye.” My father loved a good storm. “Hurricanes are not a joke.” My mother had experienced the 1938 hurricane. That tempest didn’t have a name, yet hundreds of New Englanders had died in its path. “I know.” My father shrugged in weak surrender to the truth. Hurricane Edna in 1954 had destroyed his sailboat on Watchic Pond. The hull lay in our backyard. Six years later he had yet to repair the damage to the mast. He never had much free time and five kids under the age of ten were a lot of work. “The skies have cleared.” My father looked out the window and then back to my mother. “I wanna go too.” My two-year old brother bounced off his high chair. “Then go.” My mother trusted my father to obey his promise, since he loved her enough to convert to Catholicism. “I’ll keep them safe.” My father led us outside. We lived in the shadow of Chickatawbut Hill. Branches were scattered across the yard. Overhead a counter-clockwise swirl of the cloud funnel opened to the blue heavens. The three of us 360ed on the lawn to gawk at the storm’s awesome power and glory. Rain dotted the walkway. The wind was soon once more a gale. The raindrops stung our skin. My mother yelled for us to get inside. My father lifted his finger to indicate we wanted a few more seconds. He had fought the Maine’s Great Fire of 1949. I never had seen him scared of anything other than my mother’s wrath. He quickly explained to us how hurricanes formed in the tropics. We were 9 and 8. His meteorological lesson was lost on his sons and the oppressive pressure of the powerful storm weighed heavily on our flesh. My mother’s next demand was an ultimatum. “If you don’t come in, I’m locking the doors.” She was serious. “We better do as she says.” My father guided us inside the house. He gave my mother a hug. She was relieved to have us back inside. The second half of the hurricane stuck within minutes and lasted into the evening. The beach there was ideal for watching the storm die against land. Giant waves would slap the concrete flood walls with a force strong enough to make the streets shudder with fear. The boyish joy in his voice kept us awake for another three minutes, for tomorrow promised to be a day of big waves and wild sea spray. This entry was written by Peter, posted on September 17, 2018 at 9:06 am, filed under 60s, Nature, New England, semi-fiction, weather and tagged 1960, boston, donna, hurricane, nantasket, new england, revere beach. Bookmark the permalink. Follow any comments here with the RSS feed for this post. Post a comment or leave a trackback: Trackback URL.